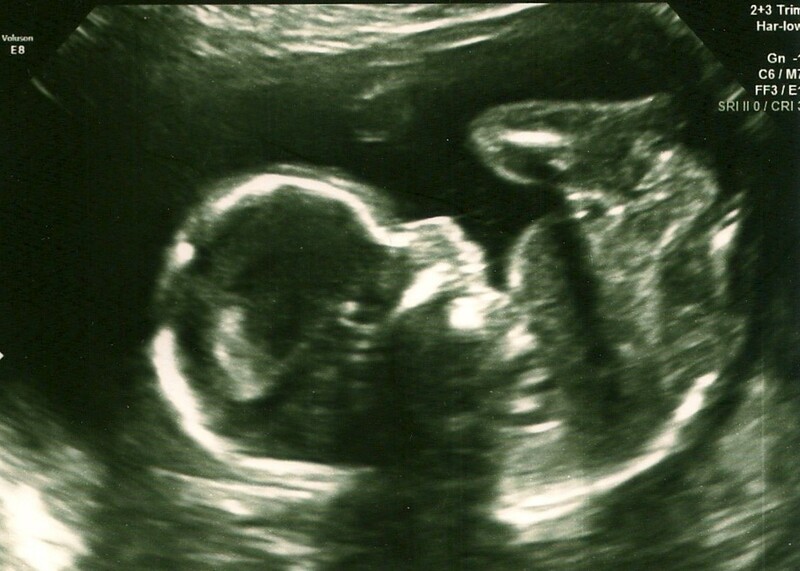 You see, I’m not the best at being pregnant. For half my pregnancy, my body rejected prenatal vitamins. I either vomited them up in fits of sweats and shivers, or they seared my esophagus with heartburn, fighting their way down the digestive tract. Everyone offered solutions, chewables, more organic options, and even a liquid green sludge that needed chased down with orange juice, but all produced the same result. People ask if I’m excited, and I choke out the right kinds of answers. When I was younger, I pictured myself wearing pregnancy like a veil of honor, rosy cheeks and a delightful little bump showing under a flowy peasant blouse, but it turns out, I’m not the glowing kind of pregnant. Some days I’m a nauseous, sweaty animal, sprouting a new layer of acne on my back; on these days, it’s hard to put how I feel into a pleasant statement. Instead, I lead with my signature defensive humor and make offhand comments about the anti-depressants that I continue to take while pregnant. “I would drink an occasional glass of wine, but I figure the baby already gets the Zoloft,” I say with a wink and a nudge. This punchline hangs in the air for a few moments of painful silence before I try to reel it back in, “but you know, the doctors are monitoring the baby, and I got a special ultrasound, and…” This is when the nice person who asked me about how I’m feeling smiles through anxious eyes and clenched teeth, nodding their head to try and keep things polite. But among all the things that I know I’m already doing wrong as a mother, I’ve come to enjoy bringing the baby to the places I go. I may not do great with leafy green veggies, but my baby will grow on laughter. My baby’s momma is a comedian. I perform in Chicago as a comedic improviser, staging twenty five minute pieces with seven to nine teammates. My three teams perform at several different theatres around the city, which averages out to two or three shows a week. I take her with me to the bar for a drink with my teammates after a tough show with low audience attendance, trading in my gin and tonics for Shirley Temples and diet Roy Rogers. She gets the consoling pats on the back my castmates offer me, and I imagine they reverberate through my body and hit her like a wave of Vitamin D.
I take her on the stage to the sound of a quickening slow clap, which she must think is for her. Receiving biweekly applause has to be good for brain development. She goes with me into rehearsal rooms where we shriek, snort, and guffaw at each other’s moves. She’s the unseen tenth player on stage, kicking to be noticed during my scene work. I often hold my belly when I laugh, as if to make sure we’re both awake to the blessing of these joy filled spaces. She is with me when we’re the only women on stage. As my body changes to hold her growing form, we shapeshift into diverse characters with their own points of view and treasure troves of specifics. On one night, I played a petite daughter stowed away in her father’s suitcase. I crouched low, tightening my body into a ball to simulate the cramped quarters and the baby tucked in to the warm curve of my body. When I worry about the way my depression must seep into the womb, tears dripping through the umbilical cord and sorrow carried through my bloodstream, I revel in a night where I’m out late at a cabaret table, watching my heroes and friends on stage. Many of us are deeply sad people, but for a night, we are artists and poets who have discovered the hilarious underbelly to the tragedy. So I’m glad that as my baby grows to the size of various vegetables, that she is growing up with laughter, that her adopted aunts and uncles are some of the funniest people in Chicago. When I fail in so many ways that I lose count, I know the baby must know well the vibrations of her mama’s laughter, punctuated with my drawn out snorts and the fog horn blats I let out when laughter catches me unexpectedly. I cherish this special time when I take the stage with a tiny teammate. As my friends and I wait in the wings to make our entrance, we participate in the ritual of assuring one another, we’ve got each other’s backs. I place my palms over my growing belly and say to my girl, “We’ve got this WIlla.” Together we laugh and make others laugh, and for a moment in time, we have everything we need. 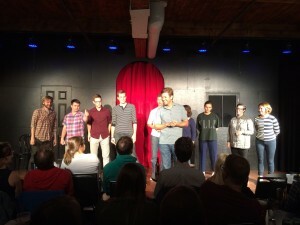 This entry was posted in Laughter and Place and tagged Chicago, comedian, comedy, friendship, improv comedy, mommy guilt, morning sickness, motherhood, parenting, pregnancy. Bookmark the permalink. “Many of us are deeply sad people, but for a night, we are artists and poets who have discovered the hilarious underbelly to the tragedy.” I love this, and I wholeheartedly believe that moms who can laugh are among the best equipped of all. Your Willa is already so very, very lucky. Thanks Bronwyn! I hope to continue to laugh as Willa grows and to laugh with her too : ). oh, what a blessed little girl to grown on laughter. My YAH story this month is about the gift of laughter my depressed-mother gave me. So, this hits a special note for me. This is so lovely, and also so profound. My own daughters are now teens, and I can assure you that so much of what you’re recognizing now about motherhood and life will continue to be true and important as Willa grows. Thanks Kristin! I’m at the very beginning of an exciting and terrifying journey and am so grateful for words of wisdom from those who are already moms! I read this while drinking my first cup of coffee, part of which has traveled from mouth to bathrobe as I choke with laughter—and tears. You capture the intimacy between mother and child in a way that evoked memories of my own pregnancies YEARS ago. Yay for morning coffee and writing friends. I’ve so enjoyed connecting with you Lisa!